I am learning to set goals and in the process am learning so much about myself and my thinking when I set goals. How about you? Are you a goal setter? What types of goals do you set? 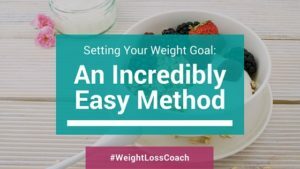 If you’re trying to lose weight, have you set a goal for your weight? What if we looked at goals as a compass, and set some action steps to move towards that goal? What if that was all there was to it? What if we didn’t use our goals to beat ourselves up? Let’s talk about weight loss goals and find something that works for you that creates action. Have you set a weight loss goal, a magic number that you’d love to hit with your weight? How has setting this goal made you feel? Is it freaking you out? Or are you taking action? If a goal does not help you take a lot of action, it’s time to look at the goal and thoughts that come up when you set that goal. I’m finding that setting goals that get me to move forward are the best goals ever. Some can be a little scary or BIG but if my goal setting process shuts me down, then frankly, I need another one. If you’re putting energy to losing weight, what would you like to try now? There’s no ONE way to set a goal when losing weight. What works for you? More importantly, what is a goal you can set to get you moving forward? Pick just ONE for this week! I’m going to move more each week and see what happens. I’m going to only eat when I’m hungry and stop when I’m full. I’m going to eat a higher percentage of fresh food. I’m going to set a goal of 8,000 steps a day. I’m going to focus on slimming down my portions with a goal of losing 10 pounds. I’ll see what I need to do to lose 10 more when I get there. I’m going to decide to not eat unless I’m truly hungry. I’ve been watching my son lose weight this year. No he did not use me as a coach. Hmmmm (smile) Nope I’m his mom. I’ve been asking him what has worked for him in terms of goal setting. He says he just looks at the next 10 pounds and when he hits that, looks at the next 10. He’s taking a lot of action but started with small changes. He is truly the poster child for Fitbit. He first started with a step goal. Then he reduced his portions but didn’t really change where or what he was eating. He tried running and learned that he likes it, he’s measuring his pace now and taking note of how far he can run. Now he is watching his water intake. It’s working, last time I heard he has lost over 20 pounds. If you’re getting stuck you might need another tool. I’ve got plenty, just click here to schedule a quick FREE Mini Power Session to help you get moving on your goals. I’ve been broadcasting LIVE a few mornings a week, come check out the videos on Facebook!